Amazon Purchases Can Support the Lyric Band! Go to www.smile.amazon.com, log in with your Amazon username and password, click on "Your Account". Scroll down to "Your Favorite Charity, type "Lyric Band" and click search. Select us, and you are ready to shop. The Lyric Band will receive 1/2% of your purchase total. Patrons and Business Sponsors are a vital necessity in helping the Lyric Band present its concert season. Please help us achieve our mission with your support. The Lyric Band is a 501 (c) 3 IRS recognized charity, so your gifts are tax deductible. 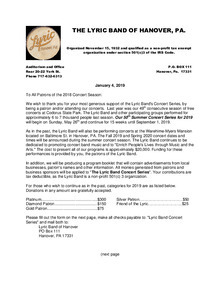 If you are interested in becoming a Patron of the Lyric Band please click here for a copy of our patron letter for 2019. 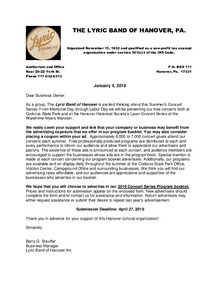 If you are interested in advertising in the Summer Program Book of the Lyric Band, please click here for a copy of our business ad letter for 2019.